Berger moved to St. Augustine in 1994. She was only 25 years old and by that time was handling a felony case load. By the time she left the state attorney’s office in 2000, she had prosecuted every possible type of case that an assistant state attorney could handle – from simple traffic cases to homicides. 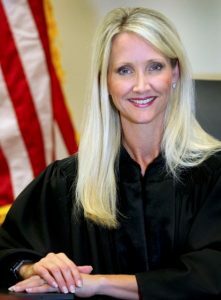 at this stage in her and her husband’s lives, Berger’s been known to take the appellate briefs from cases she’s working on to Georgia’s riding lessons and Griffin’s baseball games. Office, Capital Collateral Regional Counsel, and Florida Supreme Court until the execution of sentence. Berger also reviewed extradition requests, requests for international prisoner transfers, and executive orders involving state attorney special assignments and the suspension and removal of elected officials. She helped draft and review legislation, reviewed requests for independent investigations by the Florida Department of Law Enforcement, responded to victim and other constituent issues, and provided legal counsel to the Executive Office of the Governor and designated Governor’s agency general counsels. She was also involved in interviewing candidates nominated for judicial appointment and provided counsel to the Governor regarding the selection of those judges. As Governor Bush’s clemency aide, Berger offered counsel on all issues related to executive clemency, including whether the various forms of executive clemency such as the restoration of civil rights, remission of fines, commutations, and full pardons should be granted or denied. Berger continued as Assistant General Counsel and clemency aide until 2005 when Governor Bush appointed her to the Seventh Judicial Circuit Court where she served as the first female circuit court judge in St. John’s County. Berger was assigned to the civil and probate division for a little over a year before moving to the criminal division, where she presided over every adult felony case in St. Johns County and earned a reputation for being tough. She also presided over the St. John’s County Adult Drug Court. it much more academic and intellectually challenging than the circuit court. “I enjoy reading and writing and getting a chance to learn new areas of the law,” Berger said. She also enjoys having the time to reflect on the law and how it applies to the various issues and nuances associated with a particular case; a luxury she did not have on the circuit court. Also, because she came primarily from a criminal background, Berger noted that she does not instinctively have a plaintiff or defense bias in the civil arena. Judge Berger stated that if she could give any advice to practitioners it would be, if your client can afford it, to have an appellate lawyer at trial to provide trial support, and preserve potential appellate issues. She warned that countless appeals are lost because issues are not preserved below. As for appellate briefs, they “should be concise,” Berger advised. “Just because you have a 50-page limit doesn’t mean you have to use it, especially in a case with only one or two issues. Some of the best briefs I’ve read are short and to the point.” She recalled her days on the trial bench reminding attorneys just before closing arguments that “the mind can only absorb what the posterior can endure.” Bringing that logic to the appellate court, she says the same can be said for the eyes. Berger also noted that professionalism in brief writing is always important. As the interview came to a close, the conversation turned back to drug court. Berger needed to get back to St. Augustine because she was attending graduation that evening for several of her offenders who had completed the program. She looked forward to seeing them and hearing about their progress. Several more of Florida’s citizens were kept out of jail and off the streets as a result of drug court. Although she’s now in Daytona Beach interpreting the law and making an impact throughout Florida, Judge Berger’s legacy continues in St. Johns County.